I have gotten an annual bike refit since getting my bike from Podium. For me it is more of a bike tweak since, ever since I have had my bike (which I bought at Podium with a Fit First approach – they measure and size me and then find bikes that will best fit me), my fit has always been great. I know, from feedback, that my hips are stable when I ride, and my head does not go back and forth. To capitalize on a great fit I have worked on strength so that even as I fatigue, my body doesn’t wobble. And when I say great – I mean great. I get random strangers asking me about my fit when I ride – be it at a race or in an organized century ride. In fact, when riding Ironman Wisconsin this past September, someone came along side me and asked me if I knew Matt (the owner of Podium Multisport) and if Matt had fit me on my bike. He then stated that it was a great fit. People are also often surprised that I ride a bike with 650 wheels. But when they see me on the bike, the consensus is it’s a perfect fit. And what’s even more important than feedback from others is I know it’s a great fit because I am comfortable – I can stay in aero for the long haul, and then get off my tri bike to run and feel fresh to run be it for an Olympic or an Ironman distance race. Yes, part of it is I ride appropriately for the race I am racing and am consistent in my training, but a good bike fit can make or break all that work (as well as nutrition, strength (mental and physical), and so on) . However, even with a great fit, this past year, it felt like until I was settled in on my bike; I would want to push back from my seat to get more from my legs. I can’t explain it more than it was a feeling. I knew I needed to chat with Matt or Andy, see what they thought, and get a refit in the down-season. Podium recently acquired the GURU Fit System for fitting bikes and refits. In talking with Andy, he said it is more than just adjusting my bike fit with me on my bike (as all of my refits had been at the time). Rather, he would set the fit bike at my current fit and then go through a series of adjustments while I rode the fit bike. Then the changes would be applied to my tri bike. I jumped at the opportunity. Things start off with a body scan from the system. And then the system sets up an initial position for me on the fit bike. Since this was a refit, Andy immediately changed to meet my current bike set up. And then I hopped on and started pedaling. 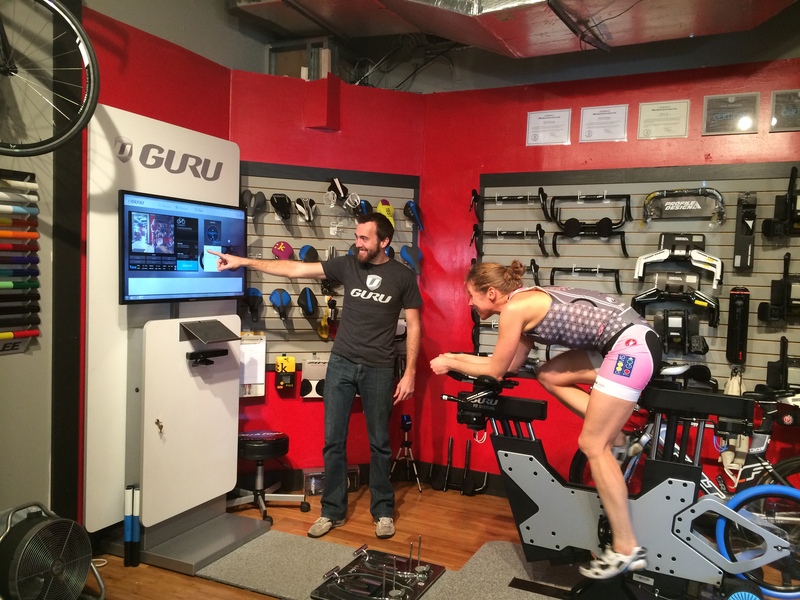 The GURU system is dynamic, meaning that as I pedal, Andy was standing away, looking at me on the bike and changing the configuration using remote controls. He would pick one thing at a time (handlebars in or out, moving the seat forward or back, or up and down, etc.) and ask me “Which feels better – position 1 or position 2? I would pedal through the change and most of the time tell him very quickly which felt better. Sometimes it took a little more pedaling, and as we honed in, like with the optometrist, there was little difference and so Andy would go with what was more in line with my goals (aggressive riding) until I didn’t like it. While pedaling, the system is scanning me. Once we had a position I really liked, Andy switched screens and looked at the metrics while I kept pedaling. They reported what Andy and I already knew – I was rock steady: my hips were firm, knees in-line and not going in and out, and my head steady. And I didn’t feel like I wanted to push back from my seat at all. I knew – it was my spot. The overall body position after the GURU fit didn’t change much for me, but the position of my seat and handlebars did. So much so that I had to leave my bike at Podium so they could re-cable it (cables may stretch when new, but they don’t stretch enough for the necessary changes). The changes were just a few mm, but yeah – they were big. If we had done a standard bike refit where a rider typically rides their own bike and adjustments are made using traditional methods, Andy could not have moved the handlebars and seat as much (or as easily) as he did – the cables were limiting the adjustments possible. And even if we had used a traditional fitbike, I could not have pedaled through the changes, had a couple of back-and-forths, and really gotten a feel for what I liked, didn’t like, or preferred. Once I got on my bike I felt the difference. I was more forward. I don’t feel like I want to push back, and feel much more stable when a gust of wind be it natural or from a large truck hit me. This means I can stay in aero vs taking a hand and reaching for my basebar for stability in higher winds, sudden gusts, and higher speeds. I am looking forward to some longer rides to really put the fit through the paces.